This 15 Minute Buddha Bowls recipe is a balanced, healthy meal that comes together in no time! It’s a flavorful combo of healthy grains, chickpeas, fruit and avocado with a creamy, citrusy yogurt dressing. Dressing: Whisk all dressing ingredients together and set aside. Filling: Divide greens into 4 servings bowls, then top each with equal portions of cooked bulgur, chickpeas, blueberries, orange slices, avocado, onion, and carrot. Serve: Drizzle with dressing and serve immediately. *Read about how to cook bulgur here. 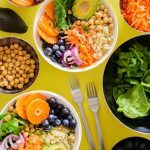 Recipe from Live Eat Learn at https://www.liveeatlearn.com/15-minute-buddha-bowls/.